Michigan Chapter's members are the best in their respective roles in the industry. Being a sponsor means that your organization has the opportunity to network with the innovators and thought leaders. Your organization benefits by getting insight into what our members think on current issues, what challenges they face, and how they approach their work. Your organization can use this insight to better target your audiences and hone your product and service offerings. Sponsors also benefit through being able to advertise to such a targeted market. Your investment will be regained many times over through your ability to directly speak to our members, showcase your products and represent your company through your logo on our website, in collateral and at events. Our sponsors also report that the greatest benefit they receive from their work with Michigan Chapter is the relationships that they develop. Our networking opportunities are unparalleled in the industry and sponsors become part of our chapter quickly and easily. Sponsors often become involved in leading industry seminars and collaborating on topics of interest. 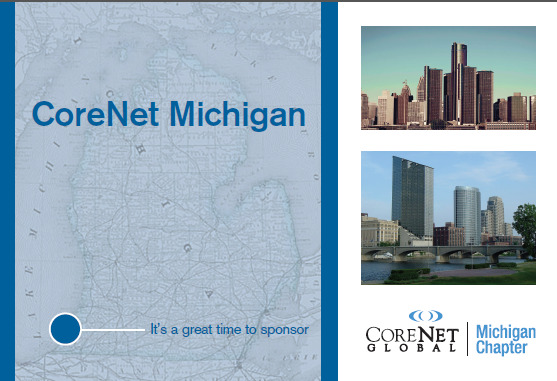 The ability to forge close relationships with Michigan Chapter's members is routinely reported as the #1 reason to get involved with our local chapter of CoreNet Global. For a complete list of Sponsorship opportunities please click the brochure link below.